Sorry I haven't posted in a while...busy time personally. I have been checking nests when possible and am discovering more nests that have failed. We are up to about twenty now, with more failures possible in that delicate time between hatching and fledging. I cannot attribute all failures to any one cause. I have observed some mystifying things...including seeing a male earlier this spring who I had not seen since 2005-2007, when he made some nest attempts that failed, and then he totally disappeared, only to resurface this spring on a nest! Now he is gone again! I have no idea where he has been or where he went, but I certainly am curious. There may be nests I do not know about. So here is my plea again to report any new nests to us! With all the failed nests, we may see some frustration nests being built at this time of year, so if you see an osprey carrying sticks, PLEASE let me know! I also have been watching a nest that had an unbanded male in the beginning of the season, and during incubation I rarely saw the male and when hatching occurred I noticed the male is banded...and he was present at this nest two years ago, but not last year! That is quite unusual. When a male does not return to a nest we tend to assume he did not survive migration. In this case, apparently there is some other explanation for his absence last year. If these birds could talk! I am busy counting chicks and I do think many nests have fewer chicks this year. The statistics will be interesting. Believe it or not, there are nests that laid eggs so late, they have not hatched yet. It remains to be seen if they do hatch or not. Those late chicks are at a great disadvantage when the time comes to migrate as they will not be as skilled or mature as the chicks that hatched earlier. So sad to be discovering some failed nests this week...not sure if it is predation, all the rain that may make it difficult for the male to provide enough food, flies (given all the reports of eagles and hawks being bothered, harmed). We will keep investigating. I appreciate the volunteers checking their nests...this is a particularly vulnerable time for the chicks as they become too big to be brooded constantly but they cannot fly. There are lots of interesting dramas and behaviors going on in the osprey world. I will try to share some of them as time allows. Tonight I am feeling fairly certain that the other two eggs on the Arboretum nest will not hatch. It's been 5.5 -6 days since the first egg hatched. That is longer than the normal interval between eggs. As I stated earlier I have noticed smaller broods from older males and suspect that fertility may drop in males as they age. Still we can be happy that Mr 79 produced one chick that appears to be healthy. This is the first offspring from this female...and possibly his last. (Our oldest male in the past was 22 years old in his final breeding season. He only produced one chick that year also, but the chick died / disappeared from the nest in late July, possible predation.) The new little guy on the Arb nest will get all the food without competition. Lucky! I love seeing his full crop! The female seemed very restless today. But I have seen no sign of hatching...I wonder if she is beginning to figure out that the eggs are not going to hatch. They seem to give up slowly. I have been checking lots of nests...some for signs of hatching, some earlier hatches to see if I can tell how many chicks are in the nest. MANY nests are hatched now, a few are not...and on the nests where I can actually see some chicks, I have only seen two little guys...doesn't mean there isn't a third smaller chick there who is just not visible. I wonder how our overall numbers will be this year...I suspect down. I am also beginning to get complaints from people who have become addicted to their neighborhood osprey nest or the Arboretum cam!!! Should I start a twelve step program? I do fully understand how invested we can become in these wonderful birds! They took over my life! We are all anxiously waiting for another egg to hatch on the Arb nest...time will tell. As I said in another post, it seems as if the fertility of older males may drop...we have seen smaller broods from them in the past. But as I have also said many times...I am still learning! That is what keeps me going...knowing that something new may occur to raise questions about our assumptions or our commonly accepted beliefs...so keep watching, and keep reading, and feel free to ask questions here! Ah yes...first chick on the Arboretum nest...tumbling around under Mom. We saw the first pip of the shell late yesterday and we awoke to the first chick! Male is standing guard. She is food begging so I hope we see a feeding soon. For all of the new volunteers on the TCM Osprey Watch this year, this is a good chance to observe the adult behaviors which are clues that a chick has arrived. This may help you to identify hatching on other nests. I know we tend to watch the chick on this cam, but also pay attention to what the adults are doing...the body position, the focus below, the males response. What a great teaching tool! We always need volunteers if anyone is interested in adopting a nest to watch over! And thanks to all of you who have alerted me to hatching on other nests! I am making the rounds to confirm as my time allows! It takes a village! We are watching for subsequent eggs to hatch at the Arb and mnay nests are brooding and feeding chicks now. Little heads are being seen on some of the earliest nests to hatch...starting to count chicks! HATCHING has begun! I have confirmed hatching on a handful of nests in the past few days. It is such a thrill to watch the adults leaning into the nestcup with tiny bits of fish! It never gets old to me. I am still trying to get around to check more of the nests. Unfortunately hatching is occurring when I am preparing for my first pottery sale of the year! 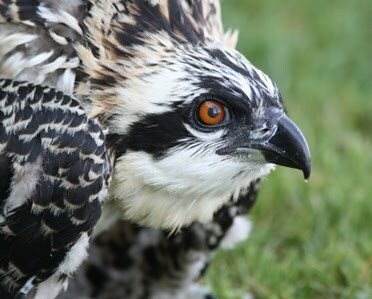 More about the ospreys soon!